Easy Solutions for Difficult to Recycle Materials! These markers do not mean the plastic can be recycled OR that the container uses recycled plastic. Despite the confusing use of chasing arrow symbol, these markers only identify the plastictype. Virtually everything made of plastic should be marked with a code. Not all types can be recycled. Types 1 and 2 (see above) are widely accepted in container form, and type 4 is sometimes accepted in bag form. Code 7 is mixed or layered plastic with little recycling potential. You should place in your bin only those types of plastic listed by your local recycling agency! For decades, the #5 cups have been the bane of the good home recycler. The cups are hard to avoid buying, and mostly useless for recycling. Many curbside collection programs won’t fuss if these are placed in a bin, but they won’t be able to recycle them either. Preserve Products offers pickup of #5s at select Whole Foods locations. Simply stack your containers until you have enough to justify the trip or mail them in directly! Avoid using any sort of bag for your groceries other than a reusable one. Reusable bags are usually sold at grocery stores, but if you don’t want to buy one of those, dig around your home and use an old canvas bag—it works just as well. If you are unable to use these bags for any reason (or just forget them on a grocery run, paper is always better). Each year we consume an estimated 500 billion to 1 trillion plastic bags worldwide. That comes out to over one million per minute. Billions end up as litter each year. According to the EPA, over 380 billion plastic bags, sacks and wraps are consumed in the U.S. each year. More shockingly, the estimated cost to retailers for these plastic bags is $4 billion. Plastic grocery and produce sacks are commonly, but not always, made from plastic types 2 or 4. These bags are often collected in barrels at grocery stores, and usually end up as plastic lumber. Unfortunately, collection is not particularly profitable so doesn’t happen that much. So what are your options if you have an abundance of these bags in your home? They can be used in multiple ways ranging from litter box liners to storage units. Check out Planet Green for more innovative ways to reuse your plastic bags. While a number of plastics are now recyclable, EcoCycle encourages you to avoid plastic and single-use packaging as much as possible—in the past 45 years, it’s increased more than 10,000%! See this guide for more information. Glass is completely recyclable and saves precious energy resources. Making products from recycled glass uses less energy than starting from scratch. Recycled glass is made into new beverage bottles, food jars, insulation and other construction materials. The downside with glass is that often times it is heavy and difficult to transport—often times, bottles have to travel further to manufacturing plants for reuse (depleting large amounts of energy). Usually, clear glass containers are recycled into new clear glass products, while colored glass containers are recycled into new colored glass products. For this reason, some recycling programs may ask you to separate glass containers by color. Many curbside recycling programs will collect clear and colored glass containers and separate them for you, also known as single-stream recycling. Labels do not need to be removed. 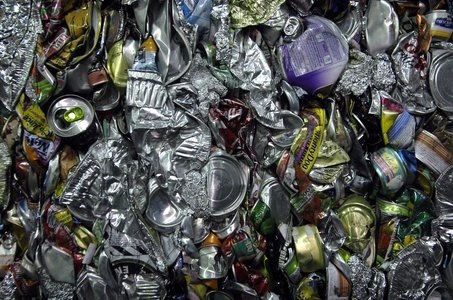 Some recycling programs will ask that lids and metal rings around the necks of containers be removed. DO NOT include window glass, ceramics, light bulbs or ovenware because these items can damage a glass manufacturer’s furnace. You CANNOT recycle light bulbs (not CFLs), ceramics, Pyrex, kitchen glassware like glasses and plates, or white skin cream jars. These types of glass have different melting temperatures than regular glass and form solid inclusions in the final product. CFLs, compact fluorescent lights, give off the same amount of visible light as an incandescent bulb, but they use less power and have a longer rated life. Although CFLs have many environmental benefits, they do contain a small amount of mercury, and so need to be disposed of properly. So what can you do? Take them to your community’s hazardous waste collection site—that information can be found through calling your town hall or looking up waste management or public works departments online. You don’t have to remove staples, plastic windows, spirals from notebooks. These get strained out when the paper is turned to pulp. Any dirty or greasy paper, including napkins, cannot be recycled! Waxed, composite, or laminated paper is generally not allowed (but check with your local recycler): this includes milk cartons, fast food wraps, and drink boxes. Thermal paper, such as fax paper, cannot be recycled. Flatten your boxes before recycling them! Many computer companies now offer free take back options; start at the manufacturers website and locate community recycling centers near you. Radio Shack recycles phones and rechargeable device batteries for free. So do many Whole Foods. Ask the retailer you are buying from if they can recycle your old mattress. Check out My Essentia to find a list of mattress recycling locations near you. Several Ace Hardware stores accept lights. All Home Depot stores nationwide accept CFLs, however only some take fluorescent bulbs. To find more locations for CFL drop-off centers, check out earth911.com. Find more information on how to get your address off promotional lists at stopjunkmail.org. Request that your banks, mobile phone, and utilities send bills online instead of through the mail. Set up a bill pay account or pay online and you’ll save another step. Be sure to check with your local garbage and recycling codes to be sure—some of these items will not be accepted everywhere. Batteries, household chemicals, pesticides, paint supplies and paints, mercury/CFL bulbs, motor oil, fertilizers, fire extinguishers, fire works, refrigerators. But they can be recycled or reused—look back through our guide or ask your local center.